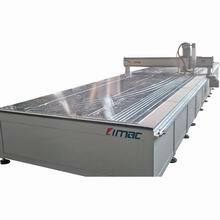 LIMAC BZ series CNC Router has a large working area of 2m x 10, which is custom-made for yacht and boat manufacturer. The machine is perfect for making aluminium yacht, boat, cruiser, and ship. Compared to plasma machine, CNC Router produces much smoother cutting surface. No after-cutting polishing is needed, which reduces labor work and time, result in low production cost. LIMAC also makes other custom size machines for yacht building factories: 2m x 6m, 2m x 7m, 2m x 12m or even wider or longer table.